The gift buying season is upon us. Every year I sit down and make a list of the people I need to buy for and struggle to match that list to gift ideas. Face it, some people are harder to shop for than others. Since I'm probably not the only one with this problem, I thought I would share some of my ideas. Today's list for the young book lovers in your life. Check back often throughout the month for more gift buying ideas! Good luck shopping! May the deals be plentiful, your cart overflowing, and your wallet not emptied. These are my, and my kids, favorite Christmas and holiday books. Santa, Are You For Real? by Harold Myra. This is an older book and can be hard to find. Some used books stores or online stores still carry it. If you have a kid who is starting to question Santa, this book is great at explaining the Santa story to them gently. A Christmas Carol. This one may be for older kids, but it is a classic. Scooby Doo and the Scary Snowman. This one is more snow themed, than Christmas. How Do Dinosaurs Say Merry Christmas? I love the How Do Dinosaurs series. My kids love the stories and the illustrations. There is also a How Do Dinosaurs Say Happy Chanukah? book available. Snowmen at Work. This is a cute book about a boy who wonders if snowmen have jobs. There are also hidden pictures of a mouse, rabbit, cat, and T-Rex on the pages. There is also a Snowmen at Christmas. Gingerbread Pirates. 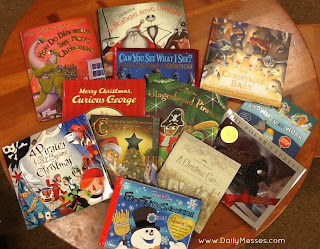 My youngest loves pirates right now, so we have a lot of pirate books. This book is about a boy who makes pirate gingerbread men for Christmas. The cookies come alive at night and try to figure what Christmas is about and just who Santa is. Corduroy's Merry Christmas. My kids loved this book when they were younger. Frosty The Snowman. This version is nice because you can record yourself reading the book and singing along! A Charlie Brown Christmas. I have many other books that I read before this one, but it is a classic.